This article is about the 1987 film. For the 2007 film, see The Walker. For other uses, see Walker. 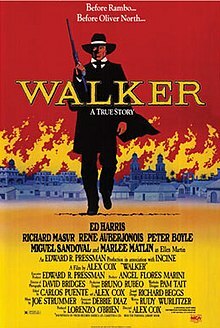 Walker is a 1987 American-Spanish historical revisionist film directed by Alex Cox and starring Ed Harris, Richard Masur, René Auberjonois, Peter Boyle, Miguel Sandoval, and Marlee Matlin. The film is based on the life story of William Walker, the American filibuster who invaded and made himself president of Nicaragua. It was written by Rudy Wurlitzer and scored by Joe Strummer, who has a small role as a member of Walker's army. The film is intentionally full of anachronisms such as helicopters, Zippo lighters, automatic rifles, and cars. It was filmed in Nicaragua during the Contra War. In 1853, soldier-of-fortune William Walker flees Mexico after a failed attempt to incite an armed insurrection. He is placed on trial by US officials, but wins acquittal on breaking the Neutrality Act. Walker believes in Manifest Destiny and has plans to marry and start a newspaper until his fianceé Ellen Martin dies of cholera. Financed by American multimillionaire Cornelius Vanderbilt, Walker and 60 mercenaries embark on a mission to overthrow the government of Nicaragua, to secure Vanderbilt's rights over an overland shipping route between the Atlantic Ocean and the Pacific Ocean. Walker and his corps score a bloody victory in Nicaragua and when the capital falls, Walker allows the President to stay in charge, but takes his mistress, Doña Yrena. With increasing disruption in the country, Walker orders the President shot and assumes the presidency for himself. From 1855 to 1857, his actions as president become increasingly manic and delusional, with Walker antagonizing his financial backer by revoking Vanderbilt's license to the overland trade route. Nicaragua and its neighbors unite to rid themselves of the unwelcome dictator, and they drive the despot out. Eventually, without the support of Vanderbilt or the US government, Walker's further forays into Central America lead to his capture and execution. Alex Cox first visited Nicaragua in 1984, during the national election campaign for which Daniel Ortega became president, to see if conditions were as bad as the American media had reported. He discovered that this was not the case. The filmmaker was persuaded to return by two wounded soldiers from the Sandinista army. He later learned of the historical Walker from an article in Mother Jones that was largely about US foreign policy in Central America and decided to bring his story to the screen. A history professor at the University of California lent Cox a library card so he could do more research on Walker. "The more I read about him the more bizarre this seemed", Cox remembers. He hired Rudy Wurlitzer to write the screenplay because, according to Cox, "He understands American guys and the mad impulse that drives certain Americans to be great men." Cox was not interested in making what he called a long, respectful historical drama that would be shown on Masterpiece Theatre because Walker "leads a disastrous misadventure. He's a pretty bad guy. I didn't think it was possible to approach it in this normal, historical, respectful style." The budget was set at six million dollars with most of the film being shot in Granada, Nicaragua. To get into character, Ed Harris led the entire cast in a 10-mile forced march through the Nicaraguan countryside. The actor was drawn to the challenge of playing someone "who has incredible moral convictions but turns into such an evil person in the name of spreading democracy." He was also drawn to the script's politics, claiming to be anti-Contra and anti-intervention in Nicaragua and saw making a film there as a way to possibly stop the bloodshed. Cox got the cooperation of the Sandinista government and the Roman Catholic Church because he wanted his production to be a "force for peace and reconciliation." The dying economy of Granada received a significant boost by the production with 300 local carpenters hired to build sets, 6,000 people hired as extras and army supplied security guards and a Soviet-built MI-18 transport helicopter used in the film. Electricity poles in the town plaza were torn down leaving homes without light. Some families were left temporarily without a telephone because the production needed their lines and the government could not afford to install new ones. The central square was covered with several inches of dirt to recreate 1850s conditions. The screenplay was edited by the country's Vice-President Sergio Ramirez and Minister of Culture Ernesto Cardenal, who were also a novelist and a poet respectively. Both men, along with the Minister of Education, the country's Interior Minister, and a military commander, would occasionally visit the set. Two people were accidentally killed during principal photography, both in separate vehicular-related incidents. For one of the deaths, the movie company paid for the funeral and compensated the family. The shooting conditions were difficult because of all of the fires the locals were building, making the air thick and hard to breathe. Even after filming was over, Cox stayed in Granada, editing the film. He said, "I think we have kind of a duty not to just be the rich gringos and come down here and spend eight weeks and then disappear." As noted by Roger Ebert in his review for the Chicago Sun-Times, "... anachronisms, guest stars, quixotic poker-faced heroes and utterly pointless scripts," were the hallmark of films helmed by Cox. There are a number of intentional anachronisms placed to draw comparison between 1850s and 1980s Nicaragua. Actors reading Newsweek and Time, for example. As the movie progresses, the inaccuracies become more and more extreme and it is evident that Cox was using the device to accentuate modern-day events with the Walker era. Historical accuracy is done away with in a dramatic retelling of Walker's coup d'état. There is no evidence that Walker ever met Vanderbilt or received his support, as the movie suggests. Rather, Walker was supported by Vanderbilt's competitors, Charles Morgan and Cornelius Garrison, owners of the Nicaragua Transit Company in his time. James Buchanan is incorrectly mentioned as being the President of the United States after Walker's trial, prior to his Nicaraguan expedition. Franklin Pierce was actually the president at the time. Ellen Martin, Walker's fiance, died in 1850. In the movie she is present at his 1854 trial for violating US neutrality laws after he invaded Baja California and Sonora Mexico, dying shortly thereafter. Minor inconsistencies include use of bolt action rifles, weapons from the World War I era, and Navy Colts in Walker's army, not in general use until midway through the American Civil War, almost a decade later, but it was obvious that Cox was little concerned with historical accuracy. Joe Strummer had worked previously with Cox on Sid and Nancy and Straight to Hell, contributing songs to their respective soundtracks. He wanted to compose an entire score for a film and Walker afforded him such an opportunity. After filming his small part in the film, he would go back to his room and record bits of music onto a four-track cassette using an acoustic guitar and a little plastic synthesizer with guitarist Zander Schloss. They drew inspiration from local music played in bars – a mix of reggae, calypso and Brazilian music. Walker garnered predominantly negative reviews; Rita Kempley wrote, "it's gross as it is muddled as it is absurd", in her review for The Washington Post. Fellow Washington Post reviewer Desson Howe criticized the "perplexing fusion of cartoon and docudrama ..." In his review for Newsweek, David Ansen wrote, "His scenes have no shape, his characters are stick figures, the wit is undergraduate and his soggy set pieces of slow-motion carnage are third-rate Peckinpah imitations." Gene Siskel gave the film zero stars and called it "Unquestionably one of the worst films of the year, made even more shocking because it was directed by the often inventive Alex Cox." Jay Scott gave the film a positive review in The Globe and Mail: "Cox exposes the limitations of historical drama in Walker with a calculated disregard of its conventions." Vincent Canby also praised Cox's film in The New York Times: "Walker is witty, rather than laugh-out-loud funny. Without being solemn, it's deadly serious...Walker is something very rare in American movies these days. It has some nerve." Director Alex Cox was never employed again by a major Hollywood studio, and his subsequent films have received only limited distribution in the United States. In a 2008 interview with The A.V. Club, Cox said, "Distribution is controlled by the studios, and I've been on the blacklist of the studios for the last 20 years ... The last movie I was asked to direct was The Running Man... which was actually quite a good film, I thought. I would have liked to have done The Running Man. It was just that Walker happened at the same time." Walker was nominated for the Golden Bear at the 38th Berlin International Film Festival. Criterion released a Region 1 DVD on February 19, 2008 with features that include: an audio commentary by Cox and screenwriter Wurlitzer; Dispatches from Nicaragua, an original documentary about the filming of Walker; On Moviemaking and the Revolution, reminiscences 20 years later from an extra on the film; behind-the-scenes photographs; and a booklet featuring writings by film critic Graham Fuller, Wurlitzer and Linda Sandoval. ^ Goldstein, Patrick. "Hollywood Invades Nicaragua". Los Angeles Times, April 19, 1987. Retrieved: February 26, 2012. ^ a b c d e f Grove, Lloyd. "Hollywood Invades Nicaragua". The Washington Post, August 20, 1987. ^ a b c d Van Gelder, Lawrence. "At the Movies". The New York Times, December 4, 1987. ^ a b Yakir, Dan. "For Harris, The Appeal was Political". The Globe and Mail, December 11, 1987. ^ a b Ford, Peter. "Desperado with a Mission". Financial Times, August 22, 1987. ^ Ebert, Roger. "Walker (1987)". Chicago Sun-Times, December 4, 1987. Retrieved: February 26, 2012. ^ Doubleday 1886, pp. 105–106. ^ Harrison 2004, p. 105. ^ Harrison 2004, p. 176. ^ a b Kempley, Rita. "Tripped Up in Time". The Washington Post, December 4, 1987. ^ a b Dafoe, Chris. "Hollywood Knocks on Strummer's Door". The Globe and Mail, December 11, 1987. ^ Howe, Desson. "Walker". The Washington Post, December 4, 1987. ^ Ansen, David. "A Yankee Devil's Manifest Destiny". Newsweek, December 7, 1987. ^ Siskel, Gene (December 4, 1987). "Siske's Flicks Picks". Chicago Tribune. Section 7, pages N-O. ^ Scott, Jay. "A Remarkable Cabaret Biography". The Globe and Mail, December 4, 1987. ^ Canby, Vincent. "'Walker'". The New York Times, December 4, 1987. ^ Murray, Noel (Mar 3, 2008). "Alex Cox interview". The A.V. Club. Retrieved Dec 24, 2015. ^ "Berlinale: 1988 Programme". berlinale.de. Retrieved: February 26, 2012. ^ "Walker: Apocalypse When?" Criterion Collection, November 19, 2007. Retrieved: February 26, 2012. Doubleday, Charles William. Reminiscences of the Filibuster War in Nicaragua. New York: G.P. Putnam’s Sons, 1886. ISBN 978-1-245-45207-6. Harrison, Brady. William Walker and the Imperial Self in American Literature. Athens, Georgia: University of Georgia Press, 2004. ISBN 978-0-8203-2544-6. This page was last edited on 22 January 2019, at 00:44 (UTC).